Straight cut bevel gears are gears where the axes of the two shafts intersect and with the apex of the pitch cones lying at the same point. 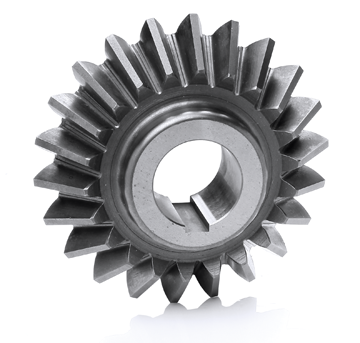 The size of a bevel gear tooth diminishes as the cone apex is approached. The tooth bearing faces of bevel gears are conically shaped. Bevel gears are most often mounted on shafts that are 90 degrees to each other but can be designed to work at other angles except 0 and 180 degrees. Bevel gears with equal numbers of teeth and shaft axes at 90 degrees are called miter gears. For high performance straight bevel teeth can be cut with coniflex (a Gleason term for crowning). This allows for any miss-alignment inherent in the machining of the gearbox or to reduce the effect on the bevel gear teeth of the gear mounts deflecting under load. Bevel gears feature in a large number of drives including the differential gearing fitted in the rear axle of motor vehicles, and the drive from the main shaft to the back shaft. They are also used on the drive of many machine tools. Our maximum cone distance is 460mm (18 inches) * 150mm (6 inches) face width. Depending on the tooth combination the maximum diameter is 840mm (33 inches). The maximum pitch is 25MOD (1DP, 3.142 inch circular pitch) stub depth, at full depth 20MOD (1.25DP, 2.5 inches circular pitch). We can provide coniflex cut gears up to the maximum size.